Prokelisia marginata A light brownish species with yellowish to hyaline wings and a pale thorax and face. The frons has dark brown longitudinal markings along the median and is widest in the basal third; it is about two times longer than it is wide. Spartidelphax detectus A pale, whitish species with a robust body. The head, including the eyes, are slightly larger than the pronotum, and the vertex in dorsal view projects past the eyes. Macropters (long-winged) are darker than brachypters, with the abdomen and lateral portion of the mesonotum a brownish color. However, macropterous wings are clear (just like brachypterous wings) and extend past the length of the abdomen. Both Spartidelphax species are extremely similar, though S. detectus is slightly smaller than penedetectus. The best field mark for differentiating the two species without dissection is the length of the vertex. In S. penedetectus, the vertex is nearly 1.5 (range around 1.34 to 1.5) times longer than it is wide; in S. detectus, the vertex is slightly shorter, being about 1.3 (range around 1.25 to 1.31) times longer than wide. Note the slight difference in the lengths with these two specimens. In penedetectus, brachypter males have an average body length of 2.33 mm while macropters have an average of 3.79 mm; female brachypters have an average length of 3.06 mm while macropters have an average of 4.07 mm. In detectus, brachypter males have an average body length of 2.28 mm while macropters have an average of 3.29 mm; female brachypters have an average length of 2.89 mm while macropters have an average of 3.61 mm. Looking at male genitalia, the aedeagus of penedetectus has ventral teeth or fine serrulations, while in detectus is has long rows of lateral teeth extending beyond the distal third of the aedeagus. Nymphs of this genus are whitish overall. For more information on Spartidelphax and differentiating to the two species, see: Bartlett 2014. Recorded along the coast where it can be locally abundant. Likely found throughout our coastal habitats where suitable habitat exists. Coastal marsh grass, spartina in particular Spartina patens (Poaceae, saltmeadow cordgrass), Spartina alterniflora (smooth cordgrass). Spartidelphax detectus is likely a specialist on S. patens, with S. alterniflora “an inferior host plant for development” (UDEL). Evacanthus ustanucha Males have moderately long wings that extend past the tip of the abdomen. The venter is orange-yellow, unmarked except for fuscous claws on the legs. The body is mostly pale brown, with two bold black spots on the head and fuscous speckling on the rest of the head, the middle of the pronotum, and the scutellum. Wings are ivory-white, sometimes with a yellow tint; there is a broad blackish-brown to black band that extends from the sides of the pronotum down the clavi and commissure of the wings before curving towards the wing tips. [NOTE: the black band (which is broken by the claval suture on each wing) does not reach all the way to the edge of the wings, helping distinguish this species from E. bellaustralis.] In males collected from Chestnut Bald, the entire pronotum was dark; see comments section below. Females have short, rounded wings with more than one abdominal segment exposed. Females are tan or orange, sometimes yellowish. They are patterned as in the males with dark, black markings on the wings and pronotum, or with markings that are paler and less extensive (more of a pale brown). In these paler individuals, there is a black mark on each side of the anterior margin of the pronotum. Adult males are 4.3-4.7 mm long, females are 5.0-6.0 mm. (Hamilton, 1983) A localized, mountaintop-inhabiting species found on several peaks in several counties in western North Carolina. There is a considerable gap between Yancey, Transylvania, and Macon counties, where this species has been recorded, so probably found at least between these two counties. However, the individuals in Transylvania and Macon counties could represent a separate species. See comments below. Has been found near high elevation spruce-fir coniferous forests, in grassy vegetation. Probably Diervilla (bush-honeysuckle), the host plant for a northern member of this genus [pers. comm. A. Hamilton]. Philaronia canadensis This species externally resembles the Meadow Spittlebug (Philaenus spumarius) but does not have the raised wing veins of Philaenus. Unlike Philaenus, in which the wing veins are not distinct, Philaronia have dark, distinct [and noticeable] veins that branch towards the edges of the wings. This is a dark species (as seen in the pics above), with a combination of gray and black on the body. The wings are covered with pale hairs, characteristic of this genus, that stand out against the dark body (see pics above); in Philaenus, the hairs are not as prominent as they are transparent and blend in with the underlying wing color. For a nice comparison between wings of Philaronia vs. Philaenus, showing hairs and veination, click here. The antennal ledge, located above the base of the antennae, is also contrastingly redder than the rest of the face. Females, which have dark faces, are 6.0-6.7 mm in length while males, which have a mostly yellowish face, are 5.4-6.2 mm long. (BG). Shellenius ballii A distinctly colored species with characteristic red and dark markings. The head, which is proportionately longer than in other similar Derbids, has a broad red band that extends across the entire length. This band narrows on the sides of the thorax, continuing onto the wings where it is considerably widens up and darkens toward the wing tips; the wing venation in this widened band is the same bright red color as the beginning of the band while the wing cells in between the veins are a dark blackish-brown color. The rest of the wings, thorax and head a re a pale yellow color. Draeculacephala savannahae A tan, brownish species that has a yellowish "faded line" around the edge of the wings. The crown is marked with thin black lines and small black dots, and the scutellum has two semi-faint black triangular-shaped black spots along the anterior margin. The wing venation is pale, contrasting with the tan wings. There is a black line around the sides of the body, and the face and underside of the body are a light brown. Females have long pointed heads, while males have much shorter heads. The female pregenital sternite is moderately to strongly produced with a noticeable projection on the posterior margin. Adult males are 5.4-6.4 mm long, while females are 6.5-7.4 mm (though males may range up to 6.9 mm and females up to 7.8 mm). A couple records from the Coastal Plain, probably more abundant near the coast (though this species may be a recent arrival in the state as it was previously known as far north as South Carolina). Near coastal marshes Reported from a grass-vetch mixture: Eremochloa ophiuroides-Vicia sp. Sayiana sayi A pale, bicolored species: the head, thorax and base of the wings are whitish while the posterior 2/3 of the wings are a golden color [in fresh individuals]. The wings greatly extend past the abdomen, with large antennal clubs extending out from the head. Along the costal margin of each wing, there is a characteristic hook-like projection projection. Check here for multiple angles of a pinned specimen: UDEL. And for additional images of this species, see: BG. A single record from the mountains; rare. Catonia picta A very colorful and distinctive hopper with reddish-brown to orange wings with a prominent grayish-white transverse band; the thorax and head are a vibrant reddish color. The underside of the body is orange-brown, as are the legs. The face is tricolored and distinctive, with the top black, followed by a white band, then black and orange-brown and finally another white band; the clypeus is a pale orange color. Adults are 4.4-5.8 mm long. (O'Brien, 1971) An uncommon species that can be locally abundant in some areas; recorded from the Piedmont and Coastal Plain. Has been found near mixed hardwood forest. Pinus sp. (UDEL); also reported from oak-hickory. 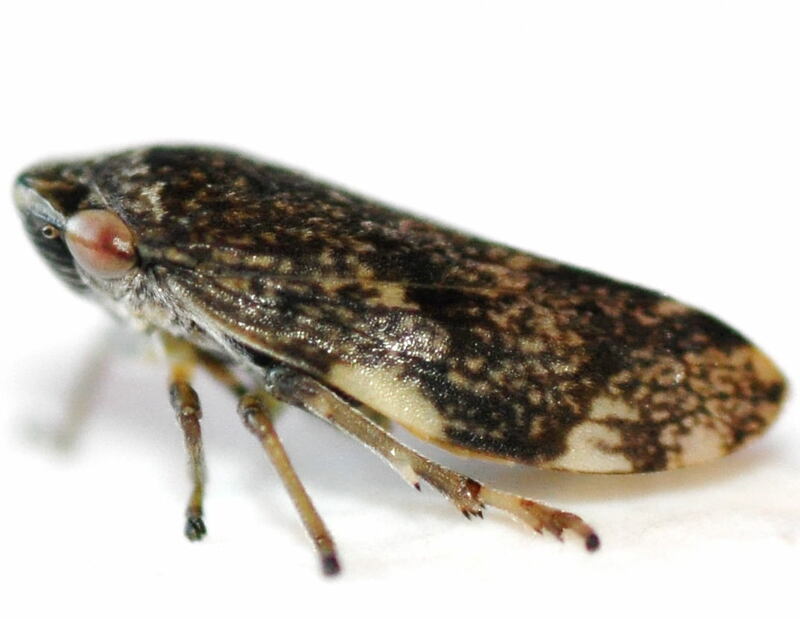 Meadow Spittlebug A highly variable species, ranging in color from brown, green, yellow, pink, pale, black-and-white, mottled, etc. It may appear solid in coloration or have different patterns across its wings. 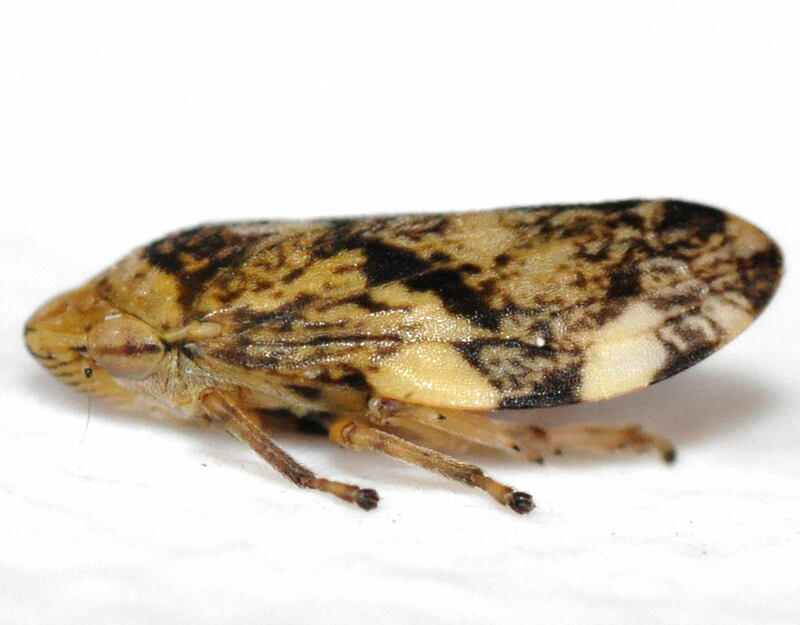 For an example of some color varieties, see: Meadow Spittlebug Variation. Wings have a fine covering of hair that typically blends in with the wing color, and veins are not raised and dark as in Philaronia. Adult males are 5.2-6.4 mm long, females are 5.4-6.8 mm. Nymphs are also variable in color: the first instar is orange, instars 2 through 4 are yellow, and the last nymphal stage is pale green NCSU. There are two distinct subspecies (of four total known) that have been recorded in the state recently: Philaenus spumarius typica, which is pale and mottled, and [possibly] P. s. quadrimaculatus, which is dark and mottled. These two subspecies, especially the latter one, maybe confused with Aphrophora quadrinotata; however, P. spumarius lacks the heavily pitted elytra found in A. quadrinotata. Common and widespread across much of the state, with many records from the mountains and Piedmont. Seemingly absent from much of the coastal plain, but this could be due to a lack of collecting or searching in those areas. Found in herbaceous, vegetated areas and field-type habitat, but can also be found near or even within forested areas. This species infests over 400 different plants, including alfalfa, red clover, wheat, oats, corn, and strawberries. BG. Has also been found on Milkweed. This species has also been found on Ambrosia, Solidago, Betula, Medicago sativa, Trifolium, Zea mays, and Fragaria ananassa (DL).